Angular 6 Tutorial With Example using Angular CLI is the topic, we discuss today. Angular is One framework for Mobile & desktop. Angular puts you in control over scalability. Meet substantial data requirements by building data models on RxJS, Immutable.js or another push-model. We start this tutorial by installing Angular using Angular CLI and then working on our tutorial. 2 Step 1: Set up the Development Environment. 3 Step 2: Install Bootstrap 4 in an Angular app. 4 Step 3: Configure Routing for our components. 5 Step 4: Create a JSON server that serves the data. 6 Step 5: Setup HttpClient. First, we need to set up a development environment. Step 1: Set up the Development Environment. The Angular CLI installs the necessary npm packages, creates the project files, and populates the project with a simple default app. Installation can take some time. Now, create a boilerplate project using the following command. So, now the project is initialized. Go into our project folder. Open the project in your editor; I am using VSCode. Also, start the development server by the following command. Step 2: Install Bootstrap 4 in an Angular app. Go to your root and install bootstrap 4 using the following command. 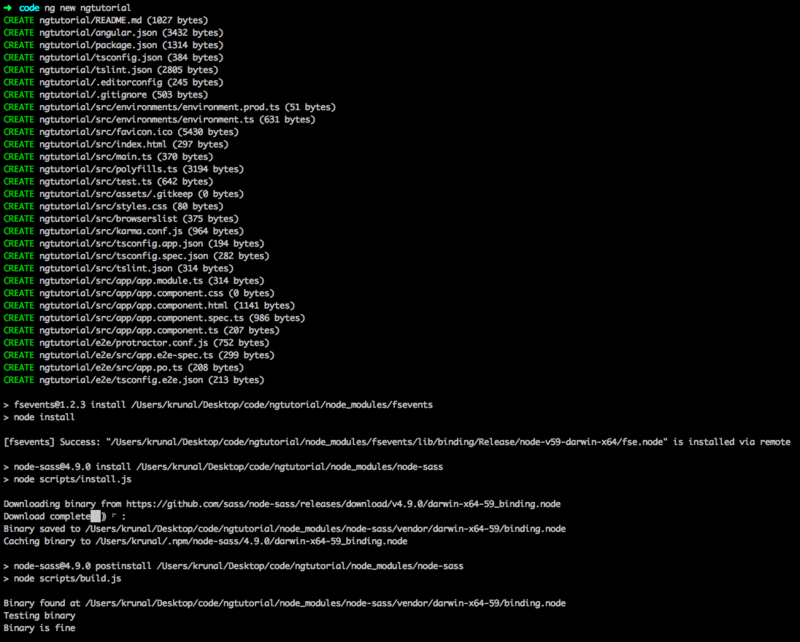 Okay, now copy the bootstrap.min.css file from node_modules/bootstrap/dist/css folder to src/assets/css folder. If the CSS folder is not there, then create one and add that bootstrap.min.css file in it. Now, add the link to that CSS file inside src >> index.html file. Now, you have successfully integrated the Bootstrap 4 Framework. Step 3: Configure Routing for our components. Now, create two components using the following command. Angular automatically update the app.module.ts file. Now, Angular is Framework and not just library. So it has Router and Http module already included. So, first, we will integrate routing for our application. I am writing the whole code inside app.module.ts file. First, we have included the RouterModule and Routes module. Next, we have created the routes array which is the type of Routes. That array contains an object, and the properties are following. Add an @NgModule.exports array with inRouterModule it. Exporting RouterModule makes router directives available for use in the components AppModule that will need them. Okay, now we need to display the output of the different routes. For that, we need to define a <router-outlet> component. Also, we need to create a navbar, so that we can easily navigate to different routes and associated components. So, inside app.component.html file, add the following code. It is root component of our Angular application. You can see that we have now routing functionality. Step 4: Create a JSON server that serves the data. Now, we have a server running that can feed the data to our Angular Application. In other Frontend libraries like React and Vue, we need to install third-party network request library like Axios. However, it is not the case in Angular. Angular is full fledge Frontend Framework, so it has already HTTP module. So first let us configure inside app.module.ts file. Now, inside users folder, create one file called User.ts. It is an interface, which tells the Angular application that, which kind of data is on the backend that we need to display at frontend. Also, inside users folder, create one file called user.service.ts. We are writing the network request code inside this file. Then we import this file inside user.component.ts file and then call service file’s function. Now, include this file inside users.component.ts file. Loop through that data and display it as a table inside the users.component.html file. So, in this simple tutorial, we have seen the following concepts. Finally, Angular 6 Tutorial With Example using Angular CLI is over. Thanks for taking this example. NullInjectorError: No provider for UserService! Please include in your code! I could not get this to work at all until I tried Nemanja’s fix. Then it worked perfectly. A bit disappointing that the tutorial itself has not been corrected. However, I should thank Krunal for making the effort. Please start your json server. [ts] ‘UserService’ is declared but its value is never read. Can you tell me difference between angular and ajax. Why ajax is not used now days. can you please mention more details about “Add an @NgModule.exports array with inRouterModule it” . This tutorial was perfect for me, except for the one correction Nemanja suggested. It would be great if you would update the tutorial with the additional code. Thanks!! Simple yet Great. Thanks Buddy..
nothing from users.compenent.html shows up in on the user page.